I was sent the colours bronze and coral to try out. I like that they both have mirrors in the lid, which is a nice touch. The finish for both shades is shimmery, so adds a glow. But no full-on glitter. The brush is the same as the square one with the Benefit blushers that’s only good if you like your blush applied in a stripe. Of the two shades I prefer the coral. The bronze just doesn’t work for my skin tone – although that being said, it does make a lovely eyeshadow. I struggle to think who’s skin it might work on as it is so goldeny and shimmery… Does this work for you?? Let me know! I want to check out the other two shades in the range now! Plus I plan to compare coral to the other coral shades I have. MeMeMe is available from superdrug. Are they on offer for 3.99 at the moment? Bought Coral and Rouge a few weeks back. Love them both so if they’re on offer I’ll pick up a few for friends/giveaways! 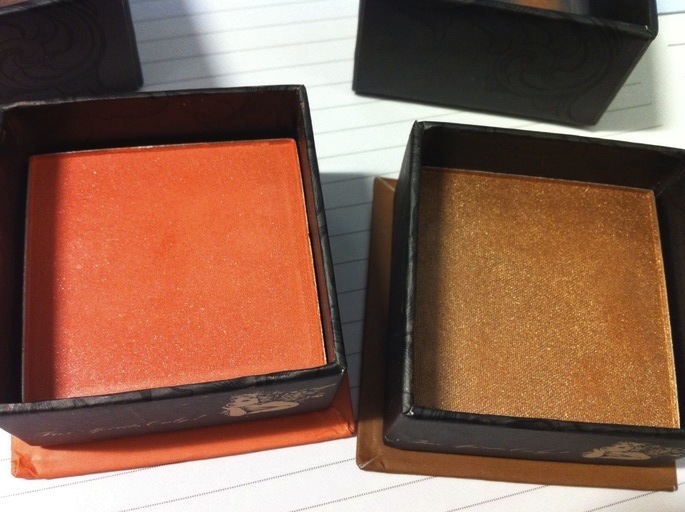 Bronze is lovely on dark skin – not so much as a blush itself but applied very lightly on top of a blush. Sorry, my fault – slight typo on the price. Have updated now! If I spot them on offer though I will blog about it. I wondered about Bronze as more of a highlight on dark skin – that has to look gorgeous and glowy! I’m glad you posted swatches, the colours actually look scary in the box, but I love how the coral actually looks when swatched. Hello! I’ve heard a lot of good things about these blushers, will have to try some! Thanks for doing the swatches, it’s always good to see how it looks on skin. Blimey, the coral looks incredibly orange! It does look quite orange, but that was swatched heavily and not blended. It would be fairly easy to go overboard – so if you try this on pale skin then take it easy!